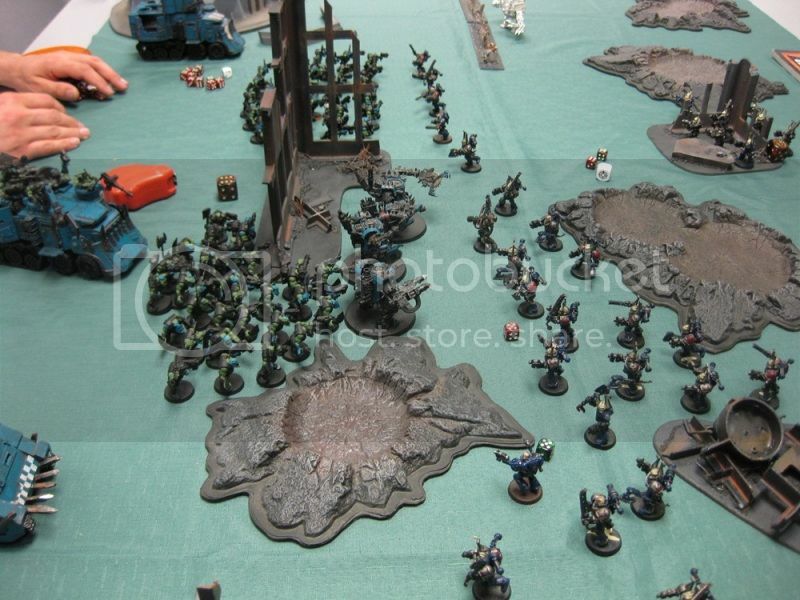 A Warhammer 40,000 blog highlighting my hobby journey through the nightmare of the far future! 5 Nobz, with Waagh Banner, all with eavy armour and uge choppas, mounted in a Battlewagon with reinforced ram, 3 big shootas, grabbin klaw, extra armour, grot riggers. Counted as Troops. Boyz x30, with a Nob (Pklaw, bosspole), 3 big shootas. Warboss is hard as nails! 5 Powerklaw attacks on the charge is messy for anyone, and the Boss sliced through everything thrown at him, the only time he copped a beating was a Wraithlord hitting him with a Wraithsword Str10 attack which i failed the Cybork invulnerable roll for. Otherwise, the pansy walker would have been cactus! In a mob of Nobz with a Waaagh! banner he's WS6, and the Nobz keep him alive long enough to do serious damage. Very pleased with how he turned out! Shokk Attack Gun Mek- the one thing i will never do again is deploy my forces or based a strategy with any reliance on the Mek to hold the flank, pin an enemy unit or otherwise. First time i ever used him, he teleported himself and the gun directly into combat with the target he was shooting at, this unfortunately turned out to be a Commisar Lord with a power fist. He got a few punches in but the commisar and friends beat the Mek to a green pulp in short order. Further games saw him miss everything that he shot at (when generating high strength shots), hitting with low strength and generally being useless. I actually blame the terrain available to me in these games, I think on a few of the other boards out there he would have dominated, but most of the ones i got were restrictive and had crappy lines of sight. In his last two games, both of his first shots were his last- double 1s meant the shokk attack gun exploded and "removed from play" everything within 6 inches- what are the odds!! However, for his points, he adds so much flavour and randomness to the game that its hard to say no to him :) If anything, he can still be useful as an area denial weapon/psychological advantage, but its no fun if you dont shoot it now is it? The Nobz dealt massive punishment to everything they came up against, and while their 'Uge Choppa attacks arent power weapons, they are Str7 on the charge, and a full squad punches out 20 of these on the charge at WS5 (yeah, that Waaagh banner is worth it!). Best moment was the Nobz and Boss annihilating an 8 man squad of Khorne Bezerkers without losing a single man, then casually waltzing back to cap an objective (as they are troops as per the Warboss). Only adjustment i'd make for future games is to throw Stikkbomb launchers onto their Battlewagon, as its cheaper to outfit this once, instead of paying loads for for stikkbombs on each nob and the boss. The Ork Boyz- as is to be expected, they are the heart and soul of my army, and they worked a treat at the full capacity of 30 boyz. 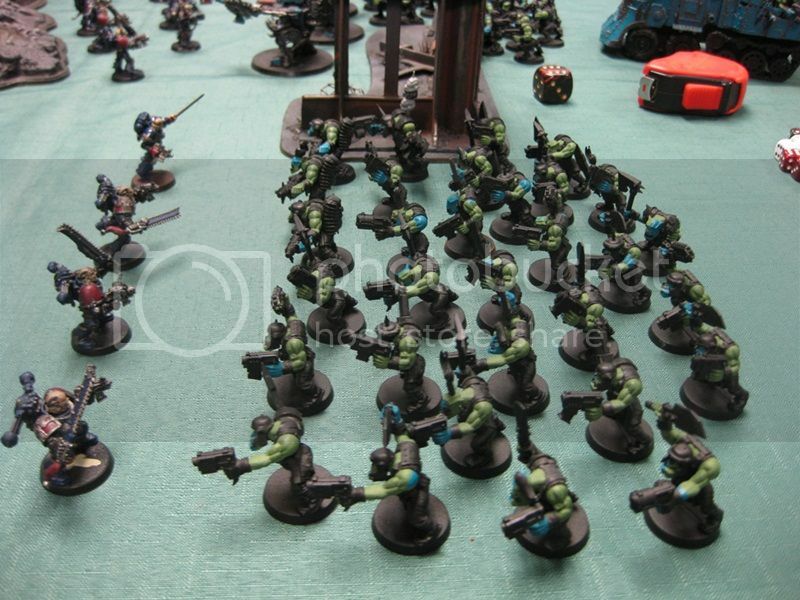 Previously i'd run with 3x 20 boyz mobz, but this only allowed for 10 casualties per mob before the Ork 'Mob Rule' couldnt be used (any mob of 11 or more models is counted as fearless). The larger mobz allowed for up to 20 casualties before i had to go anywhere near a leadership test, and even then I had the bosspole on each Nob for the all important re-rolls when I got below this point. Deffkoptas, i had two of these- one with a Buzzsaw (Pklaw) and one without, both had t/l rokkit launchas though. I ran them as seperate units, and to outflank to hit rear armour and assault or tie up artillery, nasty tanks etc. This worked in a few games, but not enough for me to be happy with them used only this way, i'm thinking of running 3-4 in squadrons (as even reduced to one, they can regroup because they are still 25% of original size). Definately more development needed with these units, although im sure they can be useful. Killa Kanz- lesson learnt: Kanz will not survive close encounters with monstrous creatures!! AV11 gets carved to pieces quickly, and only through sheer luck will they get some hits back, as they are still just WS2. Against standard infantry they can be great, i'd even rate them against a terminator squad, but MCs are jsut a no go zone. In saying that though, the Kanz did end up dropping a Wraithlord in my last game, but it was already wounded and on its way out. When i get more kanz and can tailor the weapons loadouts i feel they'll be more uselful in a specific role, as opposed to the jack-of-all trades approach i had going on for this tourney. Battlewagons- the big rumbling monsters were the Rooks of my green and blue chess pieces, with the "gunwagon" and its Killcannon dependably slowly crawling 6" per turn and hammering away with its Ordinance gun. 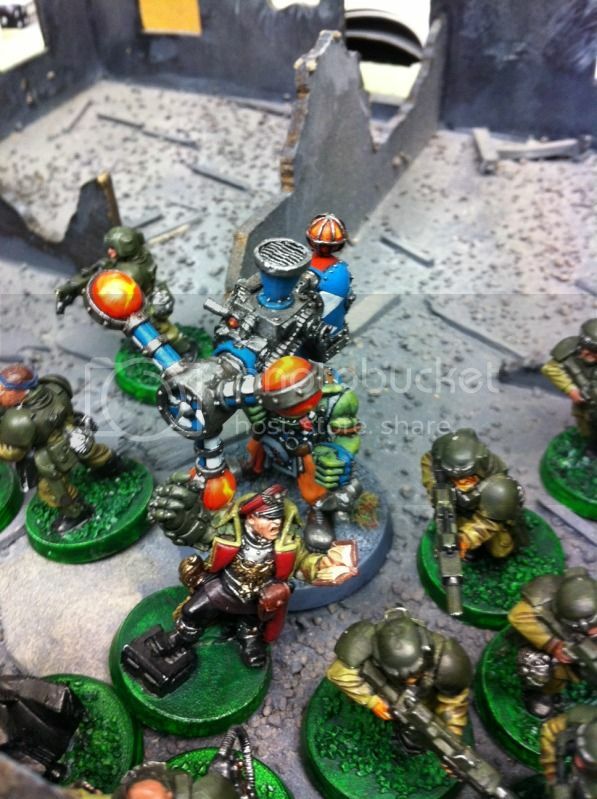 The transport Bwagon as used by the Nobz + Warboss was equally as potent, getting its cargo of frothing maniacs into close combat time and again without fail. AV14 front is very dependable, and the 12 side armour really isnt as bad as people might make out. Im still working out how best to use the Gunwagon, as its 24" Killcannon is a bit limited, but the transport wagon is great. Only changes there will be to swap out to a Dethrolla and maybe drop a couple of big shootas. Okay so you're possibly bored from all that, so here's some shiny pics from the weekend. Kanz v Kharn. the Kanz didnt make it :'( as Kharn hits like a MC... doh. The mob that beat down everyone! 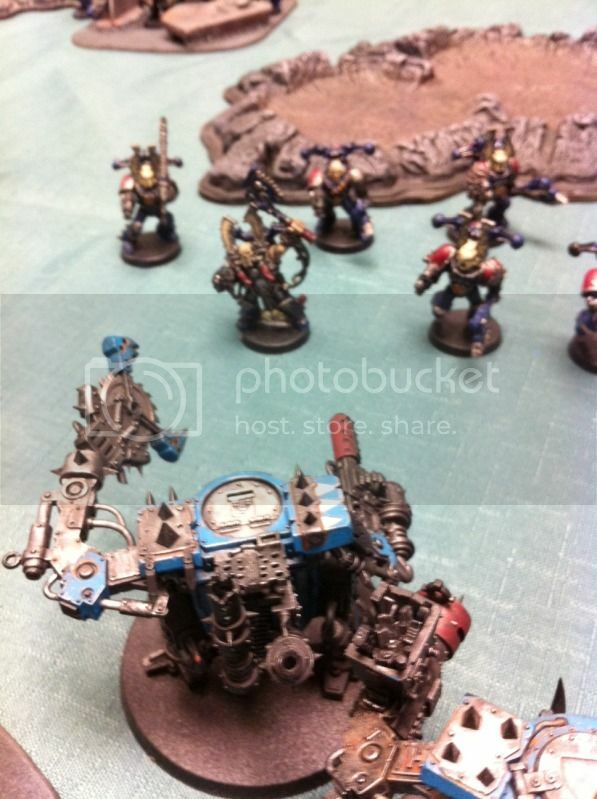 The Warboss and his entourage moved back towards the Battlewagon, waiting for the Wraithlord so they'd hopefully get the charge. Prior to this, they and the Kanz had decimated 10 Wraithguard and a Warlock in single round of combat!! As always, i'd love to hear from you if you have any feedback or thoughts on any of the above! Modular Cities of Death game board, new name and layout, and 1000 views! One year on! Comings, goings and Waaagh! 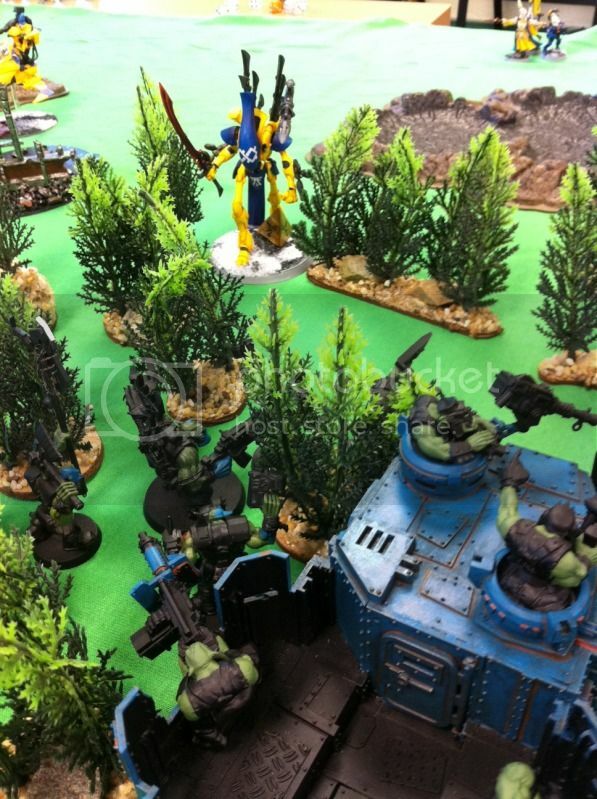 10,000 page views and new 40k terrain! 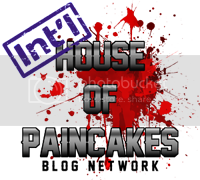 This web site is completely unofficial and in no way endorsed by Games Workshop Limited.. Powered by Blogger.